Former HPD officer Vincent Morre, in the white shirt, was caught on surveillance video attacking two men while searching for a fugitive. Former Honolulu police officer Nelson Tamayori says he is looking for a fair shake, and this week he sued the city he once worked for in an attempt to get it. Tamayori worked for a Honolulu Police Department crime reduction unit as a plainclothes officer, conducting in-depth investigations and surveillance. On Sept. 5, 2014, Tamayori was searching for a fugitive with his partner, Vincent Morre, and reserve officer Joseph Becera inside a game room on Hopaka Street near Ala Moana. Morre lost his temper and roughed up two men inside the game room as Tamayori and Becera stood by and watched. 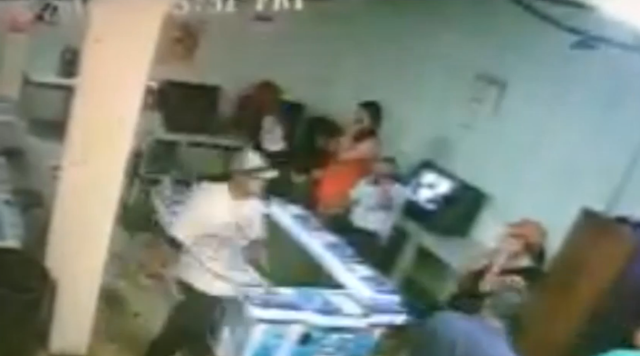 The entire incident was caught on surveillance video. The three officers eventually pleaded guilty to federal crimes. Morre admitted to civil rights violations while Tamayori and Becera pleaded to felony charges for not immediately reporting the crime to the proper authorities. Becera had also been charged with making a false statement after he told FBI investigators that he didn’t actually witness the attack at the game room. In 2016, the two men Morre attacked, Francisco Franson and Jordan Topinio, filed a lawsuit in federal court against the three officers and the city. Tamayori and Becera asked the Honolulu Police Commission to pick up their legal tabs, which is a benefit allowed to police officers under Hawaii state law. But while the commission approved footing Becera’s legal bills, the agency denied Tamayori’s request despite the fact the two former officers were in the same place at the same time. Tamayori’s lawsuit, filed in Hawaii Circuit Court, is now challenging that decision, arguing that he is just as entitled to taxpayer-funded legal counsel as Becera. Epstein said that the commission’s decision to deny his client legal representation has already cost the former officer and his family thousands of dollars in legal expenses. The costs will increase as the case approaches trial and more motions are filed, Epstein said. The city has approved spending up to $50,000 on Becera’s defense in the lawsuit. Epstein said he’s interested to see how the city defends the commission’s decision to deny Tamayori’s request for legal counsel, since the two officers are alleged in the lawsuit to have committed identical offenses. The lawsuit also stated that Tamayori and Becera were negligent because they had a duty as police officers to intervene when the attack occurred. After Tamayori and Becera both asked the Honolulu Police Commission to approve having taxpayers foot their legal bills in the lawsuit, city attorneys recommended that the commission deny both requests. But the commission split its decisions, voting 4-3 to deny Tamayori’s request and 7-0 in favor of Becera. Why was there disparate treatment? That’s a question that’s been asked by at least two police commissioners, Loretta Sheehan and Steven Levinson, both of whom have law degrees and significant experience in the legal field. Sheehan, a former assistant U.S. attorney, and Levinson, a retired Hawaii Supreme Court associate justice, both think the commission has been applying the wrong legal standard when reviewing officers’ requests to have their attorneys fees paid for by taxpayers. Even more concerning to them has been the fact that city attorneys have been supporting that misinterpretation and misapplication of the law for years, possibly resulting in several officers getting short-changed. Sheehan and Levinson weren’t on the commission when it denied legal counsel to Tamayori. But they did vote for Becera to have his legal fees covered. While they both believe he has a strong argument to have his legal fees paid for, they note that he missed a key deadline to appeal the police commission’s ruling to the state court. “It makes sense that he would file a lawsuit that would seek to have the city and county pay for his lawyer given that the Police Commission voted to provide a lawyer to a co-defendant, Mr. Joseph Becera, under identical circumstances,” Sheehan said. Levinson takes a similar view on the matter. He said Tamayori might have a difficult time convincing a judge that he still has standing because of the missed deadline.